Not a week passes that we aren’t asked: “What type of wood is that?” We don’t always know the answer to that question. At times, an antique door or mantel will be covered in several layers of old paint that we have to peel back to expose the wood. Other times, we run across a rare wood that requires a little research on our part to determine the species. Since a majority of our inventory is made of wood, we thought it would be a great idea to feature some of the more interesting species in a few of our newsletters. This week is all about a rather rare and exotic wood, pecky cypress. The unique pattern seen in this piece of pecky cypress is created by the pockets or recesses caused by a fungus that attacked the tree while it was alive. Cypress wood in general is rather light in color, has a straight grain and medium texture. Cypress trees are readily found in Southern Swamplands and can be easily identified by their unique ariel roots, called knees, that protrude above the ground or water. These trees are deciduous (unlike most conifers) and drop all their airy, needle-like leaves each the winter. Pecky cypress is rare in that it only occurs in less than 10% of cypress trees and only in older trees. The beautiful and yet unique design in the wood is actually caused by a fungus, polyporus amarus. The airborne fungi sets up after a tree has been damaged. A limb break, lightening strike, fire or any injury that creates damage or a break in the bark can allow the fungi to set up in the living tissue of the tree. As the fungus grows it creates pockets or recesses in the wood. Once the tree is cut, the fungus dies and the pecky can not continue to grow. This photo shows a local cypress tree growing next to a large pond. The tree has dropped all of it’s needle like leaves for the winter. Pecky cypress is a popular choice for doors, ceilings, wall paneling, and table tops. While you can paint this very durable wood, why would anyone want to?!! The characteristics of this rare wood are so incredibly gorgeous it deserves nothing less than to shine in all it’s glory! We currently have approximately 500 square feet of pecky cypress in stock at our wood showroom. The boards are 5″ w x 14′ long x 1″ thick and retail for $8 per square foot. Stop by our wood showroom during regular business hours to view this gorgeous wood! In this photo you can see the arial roots, or knees, of the cypress tree protruding above the ground. Recently, at one of our weekly team meetings, team member John shared with us a dream that he had. In his dream, one side of our wood showroom had large, clear, glass windows down one wall. The parking lot was full with customers who had traveled from far away. They were lined up outside the glass windows, peering through to watch our guys at work. We selected, milled, and finished our vintage timbers so that they could purchase the salvaged wood items from John. If you visit our wood showroom, you will quickly understand why John dreams about salvaged wood. The part of John’s dream where customers are coming from all areas of the U.S. has already come true. Several years ago we placed a world map on cork board and hung it in our front showroom. We asked customers to place pins in the map to represent where they were from. It wasn’t long before our map was filled with pins. While the majority was centered in the SE, there were pins that marked paths from California to New York and Canada to South America! We were amazed at how far so many of our customers had traveled. While many of our customers tell us that they were “passing through” and just had to stop, many others let us know that they traveled to Cullman JUST TO VISIT US!! To confirm our map and your pins, we were recently honored to have been officially recognized by the Alabama Tourism Department as an Alabama “Tourist Destination! !” We were thrilled to have received this distinction… a distinction that our customers have recognized for some time! We are proud to serve our State in such a great fashion and will continue to welcome visitors from across the globe! John’s dream was not too far off! When planning a trip to Cullman, Alabama to visit Southern Accents, you will discover that we have a lot to look at! Now… if we could only get Garlan to install those large windows, John’s full dream would become reality!! Plan a day trip to Cullman soon and come see us! 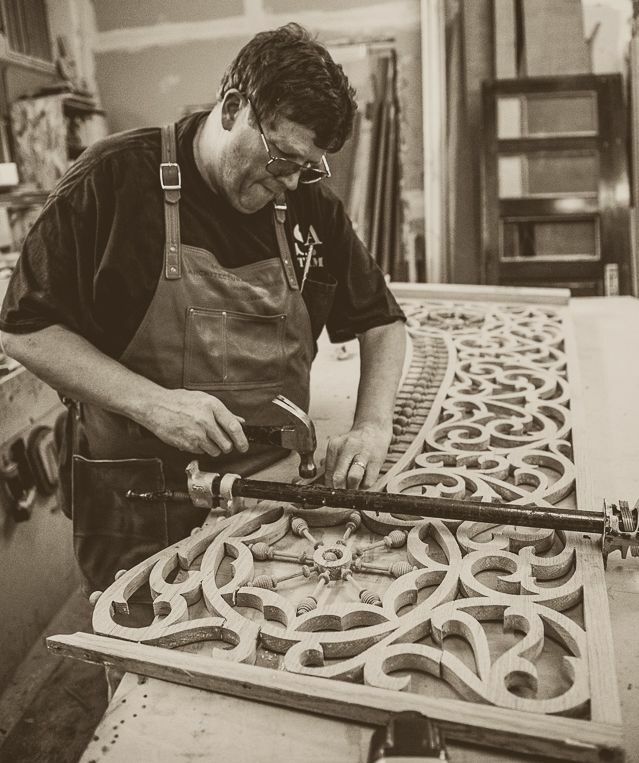 Ask Roger Long, our resident artisan, how long he has been at Southern Accents and he will tell you that it feels like an eternity… only because time flies when you are having fun! Roger, who has over 38 years experience in wood work, has been a permanent fixture in Southern Accents wood shop since 2002. Roger’s career in wood work began in 1974 when he accepted a job with a local door and sash company. Roger developed his skills over the next 14 years building doors and windows. In 1988, a F3 tornado completely destroyed Rogers place of employment, forcing him to seek new employment. Roger sought a job that would allow him to continue to hone his craftsmanship so he accepted a position with another woodworking company where he remained until the business closed in 2002. Garlan recognized Roger’s talent and seized the opportunity to add a full time artisan to the growing Southern Accents team. Roger has been a permanent and much appreciated fixture in the wood shop ever since! The quality of work turned out from our wood shop by Roger is nothing short of spectacular. The custom door shown above, one of our favorites, is just one of many that he has built. 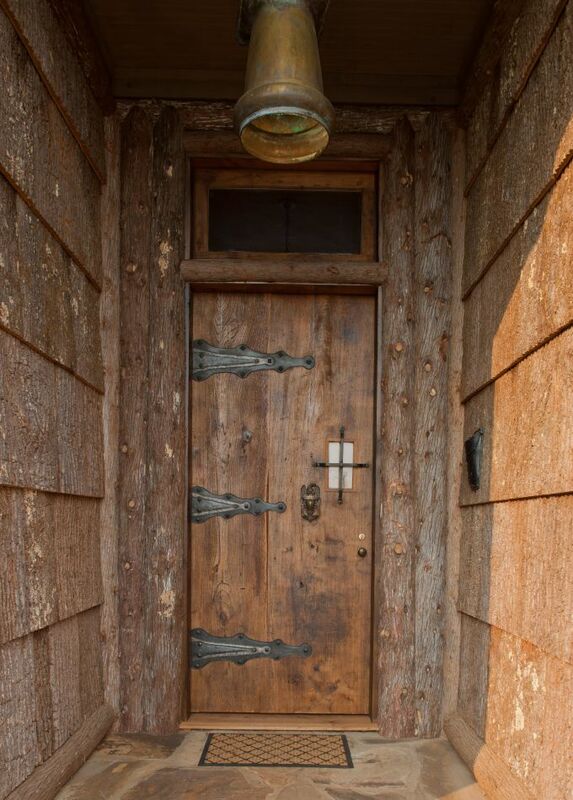 This particular door was constructed from two large salvaged slabs of wood. Roger was able to turn this customer’s vision into a beautiful work of art. 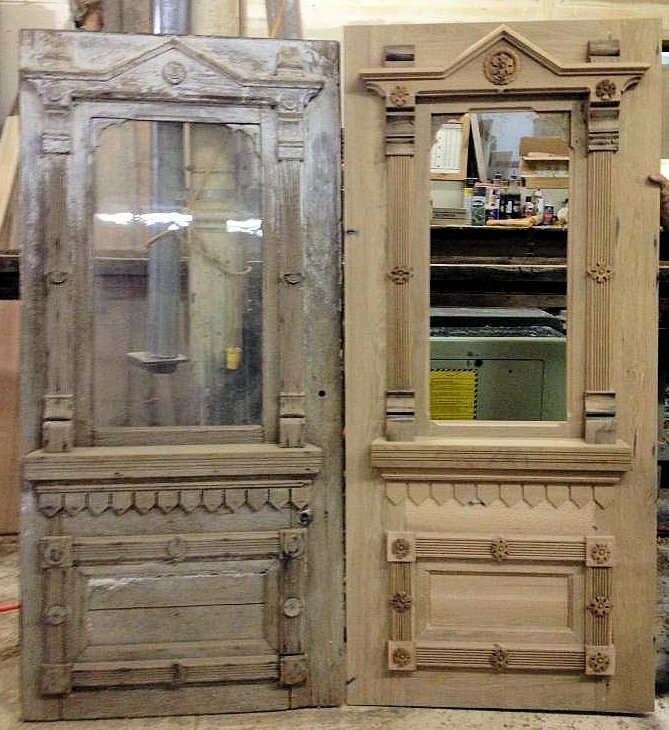 We invite you to come visit Southern Accents and browse our unique collection of antique doors, mantels, salvaged wood and more. If you can’t find exactly what you are looking for, let us talk with you about the possibility of a custom built project! The door shown on the left is an antique door. The door shown on the right is a custom built replication. Roger constructed this door in Southern Accents wood shop from salvaged antique wood. 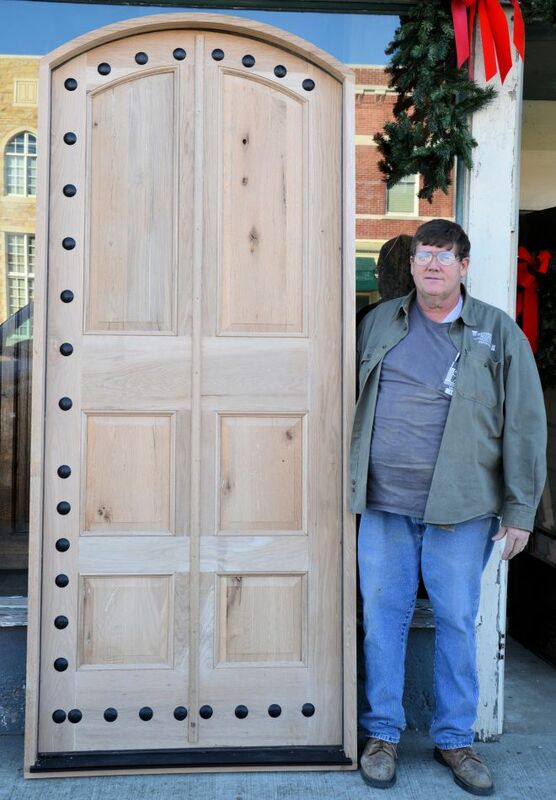 Roger Long stands next to one of the many doors that he has custom built for Southern Accents customers.